Note: This is the bound book only and does not include access to the Enhanced Pearson eText. To order the Enhanced Pearson eText packaged with a bound book, use ISBN 0134290062 . 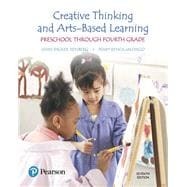 With an emphasis on thinking creatively and being resourceful as keys to surviving and thriving in today’s society, this evidence-based book provides practical ways for teachers to promote creativity, play, art, music/movement/dance, and drama for all children. It contains many authentic activities and examples to support children’s learning in the arts and content areas. The book examines the teacher’s role from a philosophical, pedagogical, and curricular stance by addressing key components, including the classroom environment, materials and resources, child guidance, assessment, technology applications, and culturally responsive teaching. Practical, readable, and illustrative features and discussions include Snapshots of Classrooms, Teachers’ Reflections, Frequently Asked Questions, Meeting Standards guidelines, Differentiating Instruction and Making Adaptations for Diverse Learners, and Integrating the Curriculum. Also included in 7th edition are samples of children's work, how to how to use cooking as a creative activity, and using nature as a critical learning tool. The Enhanced Pearson eText version features new videos, Check Your Understanding quizzes, and Chapter quizzes. Joan Packer Isenberg is Professor Emerita of Education at George Mason University, where she also served as associate dean in the College of Education and Human Development from 2003-2011 and as the founding director of the Advanced Studies in Teaching and Learning (ASTL) program from 1999-2003. She is past president of the National Association of Early Childhood Teacher Educators. She was the recipient of the 2006 recipient of the Early Childhood Teacher Educator of the Year Award from NAECTE/Allyn & Bacon and served as the first visiting scholar for the National Board for Professional Teaching Standards from 2002-2003. For most of her academic career, she has studied and written about early childhood curriculum, play, and arts integration, particularly as they affect children’s learning and development. She has taught children from preschool through grade four in both public and private settings. Among her numerous authored or co-authored publications are Creative Thinking and Arts-Based Learning, 7th Edition 2018, Pearson); Exploring Your Role in Early Childhood Education 4th Edition (2012, Pearson); The Master’s Degree in Education as Teacher Professional Development (2012, Rowman & Littlefield), and Major Trends and Issues in Early Childhood Education, 2nd Edition (2003, Teachers College Press). She currently serves on the Board of Directors for Fairfax Futures, a nonprofit organization dedicated to ensuring young children’s school readiness in Fairfax County, VA.
Mary Renck Jalongo is Professor Emerita at Indiana University of Pennsylvania where she earned the university-wide outstanding professor award and coordinated the Doctoral Program in Curriculum and Instruction. She is a series editor for Springer’s Educating the Young Child book series and has served as editor-in-chief of the Early Childhood Education Journal since 1995. She has written, co-authored, or edited more than 30 books, including Early Childhood Language Arts, 6th Edition; Exploring Your Role in Early Childhood Education, 4th Edition; and Major Trends and Issues in Early Childhood Education: Challenges, Controversies, and Insights, 2nd Edition. Her 2016 Gryphon House book, Literacy Learning for All Young Learners was recognized as a finalist for the Revere Awards. In addition, she has published two books with the National Association for the Education of Young Children, Learning to Listen, Listening to Learn, and Young Children and Picture Books , two for ACEI, and has earned five national awards for excellence in professional writing. As a public school classroom teacher, she taught first grade and second grade in low-income areas. As a preschool teacher, she worked with English Language Learners in a federally funded program and taught in a university-based, multi-age program for children ages 2 to 5 years. Theoretical and Research Base: What Is Play?